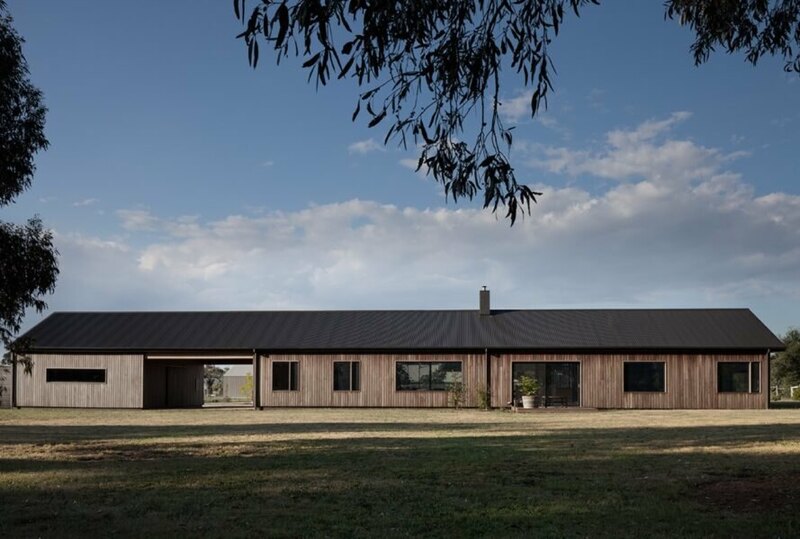 Desirous of a “low-tech, country life,” a couple reached out to Brunswick-based architectural firm MRTN Architects for the design of the Trentham Long House, a contemporary home inspired by the traditional farming structures that once inhabited the Australian countryside. 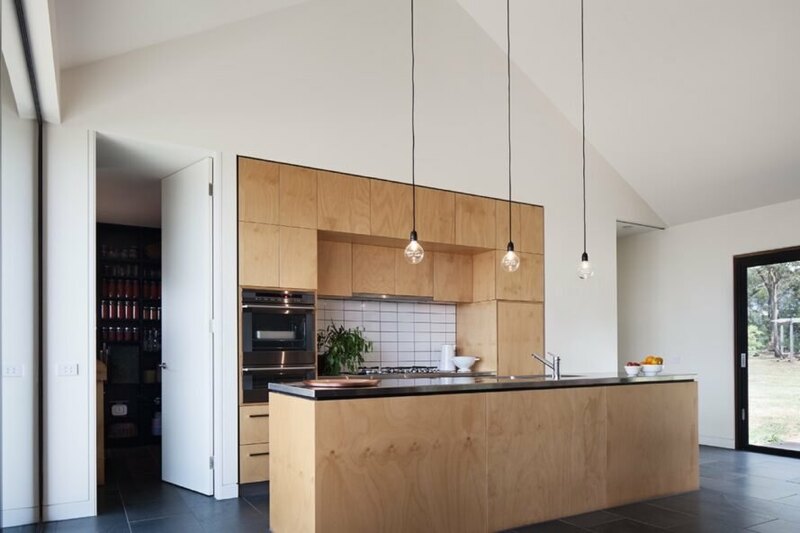 Located north of Melbourne, the dwelling consists of an elongated structure topped with a gable roof. 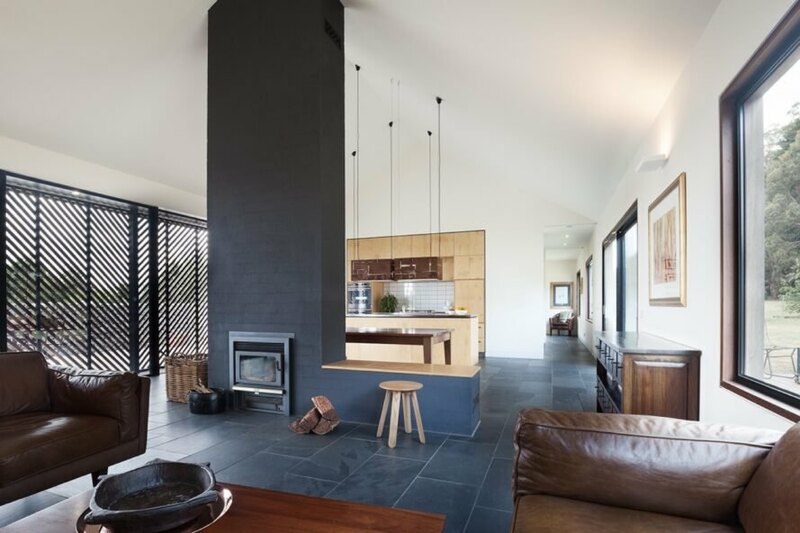 To meet the client’s brief for a largely self-sufficient home, the architects optimized the thermal performance of the build, taking advantage of passive solar principles and installing a high-efficiency fireplace for supplementary heating in winter. Built for a couple that often hosts their extended family, the single-story home spans an area of 2,787 square feet and is oriented east to west. The main living spaces are located on the west side and include four bedrooms evenly split on either side of the central open-plan living area with a dining space and kitchen. Full-height glazing with custom sliding screens open the living space to an outdoor terrace. The client’s son, a builder, constructed the project with finishes and materials selected on the basis of their durability, thermal performance and cost-effectiveness. To ensure energy efficiency, the architects kept glazed openings along the south facade at a minimum while roof overhangs and custom sliding screens help protect against unwanted solar gain. Stone tile set on a concrete slab provides thermal mass. Moreover, all rainwater runoff from the roof is captured and stored in large water tanks and reused for all the home’s water needs and for irrigation. MRTN Architects designed this modern farmhouse for a couple who loves to host family. The home is mostly self-sufficient. Passive solar techniques keep energy needs low. 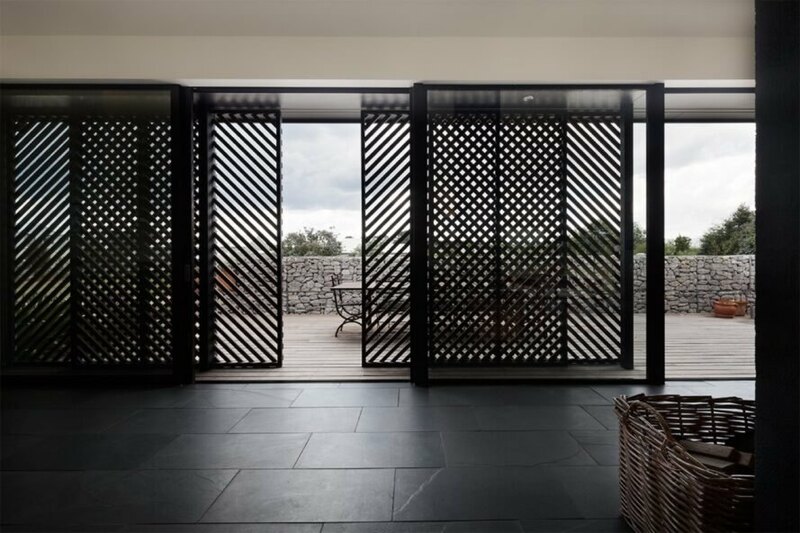 Custom screens open the interior up to an outdoor terrace. In cooler months, a high-efficiency fireplace keeps the house warm. The kitchen offers plenty of space to cook for several guests. 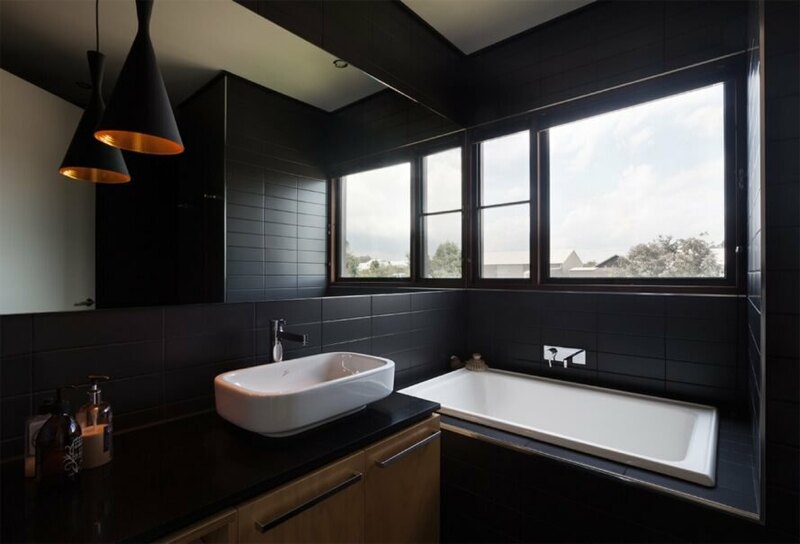 A dark, moody bathroom is perfect for unwinding after a long day. 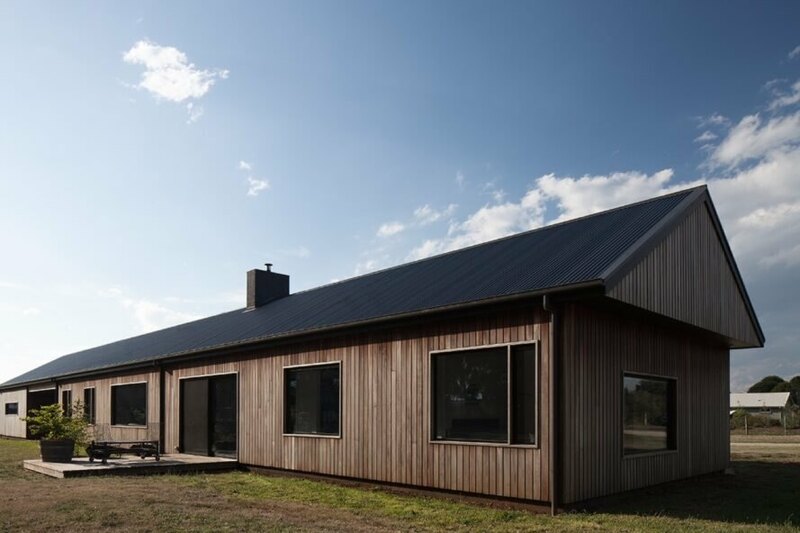 The home's spotted gum exterior and gabled roof mimic traditional farmhouses. A look at the home's simple layout.